I’ve spent almost a year learning about data-driven journalism and tools for analysis and visualization of data. I have now become confident enough to think that I might even be able to teach someone else something. So here it goes: my first tutorial. Earlier this fall Helsingin Sanomat published a huge dump of price data from Oikotie, a Finnish market place for apartments. I had an idea to build a kind of heat map where every street would be colored based on the average price of the apartments. The raw data from Open Street Map is downloadable in shape-format. 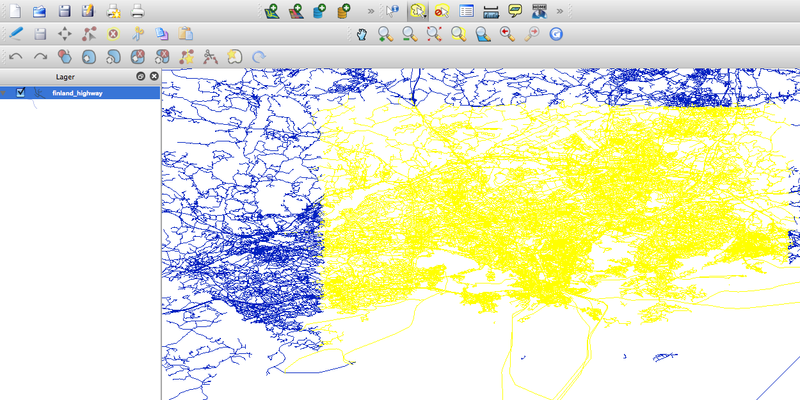 So in my case I download the shapefile package of Finland and opened it in Quantum GIS (Layer > Add vector layer). This is what the finland_highway.shp file looks like. This is A LOT of geodata, but in this case I’m only interested in the Helsinnki region. So I zoom in Helsinki an and select, roughly, the streets that I’m interested in using the lasso tool (select object tool ). To export the selected part of the map to the GeoJSON format that Polymaps can read, chose Layer > Save Selection as vector file and GeoJSON as your format. Save! Done! We got a our GeoJSON-file. Now there is just one problem: it is huge, 18 MB! But there are a lot of streets here that we don’t need. We want to filter these streets. This will require some programming skills. I turn to Ruby. This street does apparently not have a name, but the others do, which means I can extract that streets that I’m interested in based on their name. I now want to tell the computer to iterate through the GeoJSON file and extract the streets that are included in the streets array. Or in practice I approach it the other way around: I check what streets in the GeoJSON file that are not included in the array and remove them. 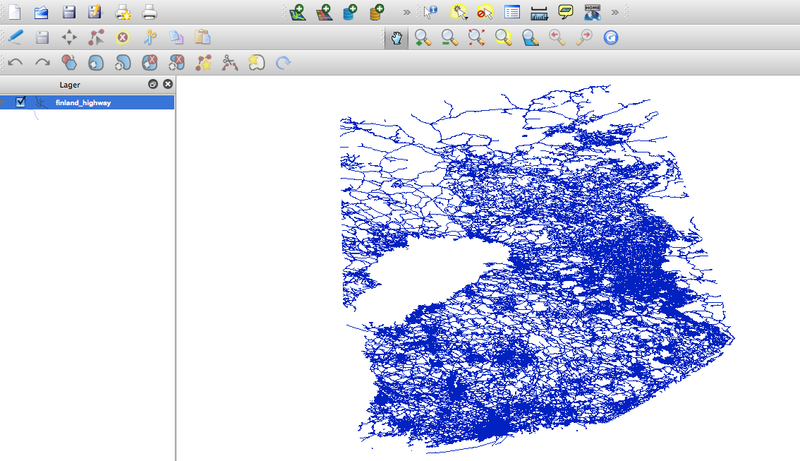 In this case data is the GeoJSON file and $streets the array of the selected streets. And voilà: you got yourself a new GeoJSON file. In my case I managed to shrink it down to 1.6 MB. I now got what I wanted in the beginning: the geographical coordinates for the streets that I want to plot, which means I’m halfway to making my visualization. Open the full map in new window. Not too shabby, right? I managed to sell this visualization to Hufvudstadsbladet which now runs it on their website.